Much of the concepts within this article are inspired by the writings by Gabriel of Urantia. Over the past few months, I have had the privilege of travelling the country with the Global Change Media street team to witness and film the Occupy movement first-hand and to present the Spiritualution smmovement. We heard about Occupy Congress in early January 2012. Online it was billed as “the largest Occupy protest ever!” and encouraged citizens to gather outside of the capital building on January 17 while the House of Representatives convened for the first session of 2012. Furthermore, the gathering encouraged occupiers and dissidents to make appointments with their state representatives and engage them at the Capital. Occupy Congress was a great idea. So great that my comrades and I knew that in mid-January, we would be travelling 2,000 miles to our nation’s capital. Congress was reconvening after the three-day, Martin Luther King, Jr. Day weekend. With Dr. King’s legacy of activism, we imagined that there would be a substantial presence on MLK day in Washington, D.C. We scoured the internet for marches and demonstrations and quickly found Occupy the Dream, a gathering of “members from the African-American faith community [who] have joined forces with Occupy Wall Street to launch a new campaign for economic justice inspired by the legacy of Dr. Martin Luther King Jr.” In Washington, D.C. Occupy the Dream was holding a demonstration outside of the Federal Reserve, while at the same time similar marches were staged outside of 15 other Federal Reserve buildings in cities across the country. Between Occupy the Dream, Occupy Congress, and an obligatory visit to Occupy D.C. at McPherson Square, we knew that we would have a full schedule. You will have light in the night, shining so bright. It’s not by power or might, but by the spirit’s light. On that bitter cold Monday morning in January, we emerged from the D.C. metro station, maps in hand, walking along Constitution Ave. looking for Occupy the Dream. I had watched the newsreel footage of Dr. King’s famous “I Have a Dream” speech a few days previous and expected to see an ocean of people covering the National Mall, standing shoulder to shoulder; hanging on the every word of a charismatic, black preacher. As we approached the demonstration I had to abandon my lofty expectations and occupy reality. There were about a hundred people gathered on the sidewalk, all circled around a well-dressed man behind a microphone, while behind him was a cadre of activists and supporters standing in front of the Federal Reserve building. The man preaching was Dr. Jamal Bryant, pastor of Empowerment Temple, a 7,500 member church in Baltimore, Maryland. Bryant was one of the main organizers of the event and served as master of ceremonies. In his speech, he cited Dr. King saying, “Injustice anywhere is a threat to justice everywhere.” Before introducing the other speakers, Bryant reminded the crowd that, “This is not an event, this is a movement,” and encouraged everyone present to follow the Occupy movement. Bryant welcomed United States Marine Corps veteran, Sergeant Shamar Thomas to address the crowd. Thomas is an Occupy Wall Street supporter from New York City who became an overnight celebrity when a YouTube video was posted of him, very vocally, confronting NYPD officers in Times Square. Thomas is a force to be reckoned with. He has a he-man physique and the most gentle and gregarious spirit you will ever encounter. He too paid homage to King in his speech recognizing him as a man of faith who was willing to the organize people and motivate them to become activists. After Thomas spoke, Bryant approached the mic to introduce Farajii Muhammed, a Muslim youth-leader from Baltimore. Muhammad spoke of the next generation and our responsibility to provide them with a world worth living in. After he spoke, he led the crowd in marching back and forth along the sidewalk, chanting in call and response style, “We fight to live, and not to die. We want justice, so we occupy.” We marched for an hour or so before Dr. Bryant gathered up the crowds for final statements followed by a closing prayer which he ended by saying, “The scripture reminds us, ‘it’s not by might, nor by power, but God’. We need your spirit. And in the words of our revolution, we declare, ‘we shall overcome, today!’ And those of you who believe it, instead of saying amen, shout Occupy!” And they did, and it was good. It goes like this. Physically eradicate the insurgents’ logistical base of operations to disrupt communication and organization. The sun was downing, but activity was picking up as we meandered our way through the streets of Washington into McPherson Square, the other “Freedom Plaza.” We arrived in a spirit of reunion. Occupiers from across the country were arriving. Drummers were drumming and a pair of vivacious Occupy D.C. librarians were frantically trying to weatherproof their mobile research unit because Tuesday’s weather forecast called for rain. The first person I ran into was Jesse Lagreca, another Occupy Wall Street celebrity made famous by a viral video of him confronting FOX News. I had met Lagreca in New York during Occupy Wall Street’s first months in Zuccotti Park and was glad to see that he had made the trip to be in Washington for Occupy Congress. Minutes after running into Lagreca I met an Occupier that I had been following on Twitter to receive Occupy Congress updates and another young man that I had met at Occupy San Diego. We met Occupiers from Portland, Seattle, Los Angeles, Oakland, Asheville, Boston, and New York. This was the gathering place of the movement, and it was happening all around us. It was getting dark and cold. We knew that the next day was going to be big, so we looked for the nearest train to take us toward our lodgings. We had been uplifted by McPherson Square, but across the street at the metro station we were starkly reminded that not all of the 99% were at Occupy D.C. There in the dusky glow of the metro station, was a small group of homeless people sitting against the wall trying to keep warm. Directly above them, in a wry and ironic display of inequality, was the official D.C. metro sign offering directions to the White House. A demonstration should turn you on, not turn you off. Like Occupy D.C. the night previous, Occupy Congress was more of a gathering than a demonstration. People from all across the country had made it to the west lawn of the United States Capital, a symbolic monument of democracy. Upon arriving, we immediately recognized people that we had met from other Occupations. It gave me a sense of how intimate the Occupy movement still is. There are not yet masses of people involved; it is a relative handful of dedicated individuals. The media likes to make a big deal out of Occupy as being a “leaderless movement.” At this point, Occupy doesn’t need more leaders, what it really needs is more followers. When I first heard about Occupy Congress, I signed up on an email list to keep up to date with developments. I was amazed at the amount of conflict which arose between the various organizers and others commenting from the sideline. Some wanted to pursue permits in order to have a legal demonstration, while others thought applying for permission to assemble was kowtowing to an unjust system. Some wanted to schedule a march while others wanted the event to be more “in the moment.” Green Party presidential candidate Jill Stein tried to sign up for a spot on the open mic and all hell broke loose. Half of the people felt that it wasn’t right to limit anyone from using an “open mic” and that it promoted communication. Others vehemently denounced the use of the event for political purposes. As one organizer wrote, “Politicians are a direct expression of the problems we are fighting against, it doesn’t matter what kind of person they are or the platform they use. Politicians act against our interests simply through existing—they derive their power from our loss of autonomy. There should be no outlet for them to participate.” Even before the event began there was division in the ranks, what few ranks there were. The first thing we witnessed on January 17 was an official Occupy Wall Street spokesman approaching a very popular, well-known independent journalist and calling him a “snitch” on his Livestream/Internet broadcast. Weeks after the incident, these two Occupy brothers were still suspicious of each other and slandering each other online. One thing is for certain, these divisions will destroy the Occupy movement. It is imperative that Occupy develop an appropriate method of conflict resolution. Meanwhile, throughout the day at Occupy Congress, there were some exciting moments. Someone did storm the police barricade and was arrested. After a General Assembly, most of the protesters left, en mass, to demonstrate on the steps of the Raeburn House Office Building. The Raeburn Building is across the street from the Capital to the south. It houses about a third of the offices of the United States House of Representatives. As the daylight waned, hundreds marched to the Department of Justice and the White House. Changing the world sure does work up an appetite, so we decided to Occupy a local establishment for dinner. We were seated in a quiet Thai restaurant when the highlight of our day walked in. A few blocks away, masses of angry protesters were gnashing their teeth in the dark when two unassuming men walked in. They sat at the table next to us looking like long lost brothers. One wore a suit and tie; the other wore a shirt that read “Occupy.” We couldn’t resist talking to this mismatched pair and asking them what brought them out to dinner together. It turns out they met in the gallery of capital while they were both attending that day’s session of congress. The guy in the tie was a congressional aid from South Carolina on his first day of work. The guy in the t-shirt was one of the congressmen’s constituents and an Occupier. We were close enough to hear to a lot of the conversation between this liberal Occupier and this young conservative politician. I’m still not sure who picked up the tab, but I have no doubt that these two young men made deeper and more real, lasting impressions in each other’s lives than all the mobs screaming at the police and cursing the congress. This meaningful interaction would have never occurred without the all-call to Occupy Congress, but how different the day could have been if more individuals would have taken time to seek understanding, instead of being so demanding. I’m convinced that if we are to get on the right side of the world revolution, we as a nation must undergo a radical revolution of values. We must rapidly begin the shift from a thing-oriented society to a person-oriented society. In the end, it’s about people, not policy. 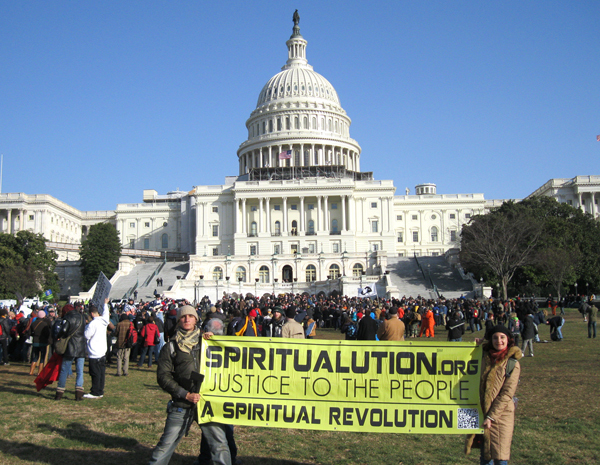 Of the demonstrations I attended in Washington, D.C. in January 2012, I feel that Occupy the Dream was the most successful. It wasn’t the most well-attended, but the people there listened to each other, respected one another, and supported each other during the entire demonstration. The individuals that attended Occupy the Dream walked away feeling more in love with their fellow man and woman. They prayed together and stayed together marching up and down a block of sidewalk. In contrast to the other gatherings of far-reaching tribes of rabble-rousers, Occupy the Dream was a tight-knit family; they stood united. The Occupy movement can take a lesson from the black church activists that have managed to focus their aim and in so doing, strengthen their power of change.